Today I did something I never thought I would have the strength to do again. I don’t know why, I’m not sure how, there was no occasion, no rhyme, no reason. It just needed to be done. I just needed to do it. And not just any pie, I baked an apple pie. I wish the apple pie was one I made for Father’s Day, for my dad. I wish I had created the pie, as was tradition, for my dad’s birthday. I wish it was a pie I had baked for Thanksgiving to take to my parent’s house. But it wasn’t for any of those reasons I baked. It was just me, making a pie, for another average day. And yet, as the task was completed, the pie still hot from baking in the oven, I had the realization that what I had just created might possibly be more than just a dessert. The pie might actually be my way to acknowledge a few things. My dad taught me to not be a quitter, or rather he tried to teach me that. Honestly, I’m still prone to wanting to quit when the going gets tough. And I don’t always feel inclined to jump right back in the saddle when I’ve been knocked down… but I know it’s what dad would want me to do. Thankfully, I know he would also understand if it took me a while to muster the strength to do so. It took me a year and a half to find strength enough to make an apple pie. A year and a half to face the pain of knowing I couldn’t deliver the pie I just made to my dad. Maybe the pie is proof that I can rise up out of pain and persevere, perhaps not without the pain, but in spite of it. Maybe it’s just me baking a pie and nothing more. Quite possibly, it may be it’s me trying to stubbornly prove to myself I can rebuild. That being said, I’m not moving on, not in the sense that people so tactlessly state I should do from my grief. I’m not leaving the past behind. I’m not ‘getting over it.’ Not feeling all better. Yet because of the love I have for my dad, because I want to honor him, I’m going to give my best attempt to be resilient, to move forward, to embrace this next chapter in my life. I’m going to press on and try to press the pie dough into my pie plate with the same amount of love I would have in creating a pie for him. “But I also know one more thing: no matter how hard I try to create the perfect apple pie, no matter how much love I try to bake into it, no matter how precisely picked the ingredients are, the pie will not be the same. What gives you strength to persevere? 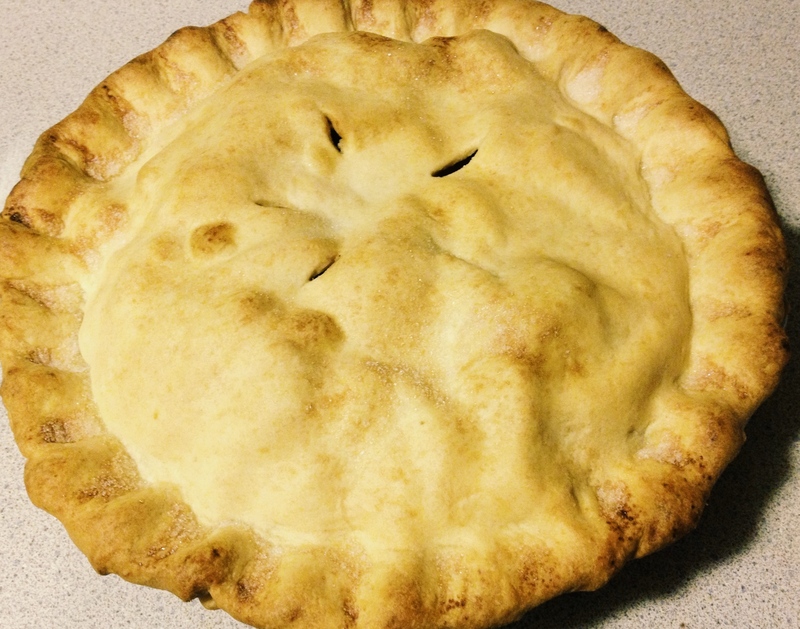 Posted in cooking, lifeTagged apple pie, baking, dad, grief, grieving, hope, life, loss, loveBookmark the permalink. Jaklyn, Your expression of love for your dad is beautiful. I don’t think it was just baking a pie and nothing more…I think…your heart just said…it was time. You never know when those moments will hit right? ❤ Along with the bittersweet…it is a beautiful pie honey. You’re right Natalin, the moments always come at the most unexpected of times.